Hey there BeastieBuddies! Can it really be May already?! 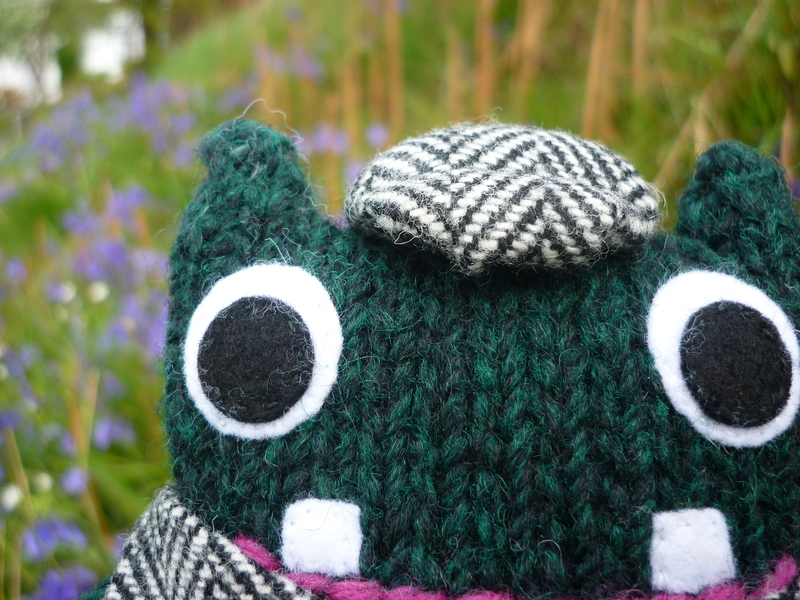 As you can see, bluebells are perfect for a Beastie-sized game of hide and seek. …Plunkett was heading for the hills! But he really shouldn’t have worried. This bee is one friendly critter. I’ve actually been meaning to develop a pattern for this busy little lady for ages! My Mum has been working tirelessly over the last couple of years to make life easier for our native bees, which are facing all kinds of problems due to habitat destruction and a particularly nasty parasite called the varroa mite. I had hoped to provide her with a swarm of felt bees to promote her Bee Garden project at Moneypenny’s Lock on the Newry Canal last summer, but of course I didn’t quite get around to it! This year, the springing of spring got me thinking about bees again… and it happened to coincide with a call for submissions for a Craftivism event in The Make It Shop in Manchester by The Snail of Happiness, whose blog I’ve been following and enjoying since I started here a couple of years back. Finally, the extra nudge I needed! So in the past week, three little felt bees have buzzed off to the UK, each with a hand-drawn mini-zine about some simple things we can all do to help out our hardworking insect friends. And yes, Mum finally got some bees of her own to snap in her Bee Garden! So, what’s next for the bees? Well, I had a lot of fun making them, and once I’d figured out the angles of the pattern, it was actually quite a simple make! So I’m toying with drawing up the templates and putting them out there so everyone can have a go – what do you all think? Let me know in the comments! Previous Post Cambridge – Worth a Punt! Next Post A College Fit For a King… Or a Beastie! Yes, that happens to me all the time too 😆 And thank you… I bet your local bees just love your beautiful garden! Thanks, Alois! I’m a big fan of your photos! Thanks so much… they have arrived safely and Danielle and I are just blown away. You should certainly draw up the pattern. Love your bees, they make great beastie companions. I try to make my front and ( outer) side garden bee & butterfly friendly. I replanted part of it last year, when my new foxgloves & poppies bloom I’ll take photos. Oh, brilliant! You and your Mum both have such lovely gardens… Your local bees are lucky to have you. My balcony garden is going to need a few more flowers if it’s going to make the grade… Must get planting! The bee is delightful. I had a deliberately bee-friendly garden in Scotland and need to look into what I could plant here in Pennsylvania that would really appeal to them while also taking into consideration the fact that I am not a great gardener. Hahaha, tell me about it! I find I’ve had most success when my green-fingered parents do the planting, and I swoop in and claim the plant when it’s big enough to survive my “care”! Maybe I’ll improve with practice though. As for finding local bee-friendly planting ideas, have you a botanical garden nearby with staff who could help you? Might be a fun family day out, too! What I did in Scotland was plant versions of plants that thrive in the wild, such as heathers. I figured if they could survive not being tended at all then they could survive me. As for here, I’ve been making note of the plants that attract bees and have been gradually identifying them. A further step will be to identify which of those plants might survive me. I can’t do needy plants. Delightful bee and bluebells! The bee is absolutely adorable – I love its fluttering, heart-shaped wings. A beautiful reminder of the love and sharing that happens in nature! Thanks for this reminder and dose of Spring (it’s gone back to winter-like here in Chicago for a few more days). If you published the pattern, I may have to try my hand at making a little bee. I really enjoy felties! That’s two votes for the pattern then… Sounds like an endorsement to me! I’d better get started, and maybe a tutorial might be a good idea too. Thanks, Shirley – hope you manage to shake off that second winter soon! Love them and love that they might help other bees! Hello! 🙋 Nice to see you here! And thanks for checking out the newest addition to the Beastie (Bee-stie?) family 😀 I’m actually hoping to do more with these, so stay​ tuned! How are you getting on with your crochet? I enjoyed reading this post! Your bee is so cute indeed and you are one so very lovely soul! Ha Ha Ha. Poor Plunkett. 🙂 That bee is adorable. Nice work! Ha ha. He’s a beastie after my own heart. Your felted bee is adorbs! But tell the Beasties that I would have totally run away–and did! a few summers ago when my husband started trying to raise bees. Whoa! terrifying, even if they were just protecting their home 🙂 I’ll stick to the felted kind any day! What!? How did I miss this post? I showed it to my bees and they were super excited and all gave you a collective (albeit, buzzy) “Thanks! !” Also, just noticing the comment above, you can (if Dublin regulations allow) keep bees in a rooftop hive. Bees actually do fairly well in cities and suburbs due to the variety of plants people keep. My bees (kept in my rather small garden) just swarmed twice last week, which not only means a healthy hive, but that I’ve “donated” a few thousand bees to the world’s honeybee population :)).